A Time of Realization, Discomfort, and the Battle to Complete my Identity Abroad. These past few days have been filled with city wide tours, organized chaos, big lights, beautiful sights, and people moving at their own paces. My London experience has been both interesting and refreshing. I have been opened up to a history that I knew little to nothing about, and again I am astonished that my current reality resides in London. A truly beautiful city, with a rich and distinct culture, and symbols to provide the people of the world, it’s story. As I describe my experiences over the past few days, please do not take my tone as pessimistic or ungrateful, because of all the students on this trip I know what it is like to come from nothing, and to finally be not only in college, but abroad, is something remarkable for me. And yet, I find it troubling to appreciate the city and revel in its beauty without having reservations about how my culture and identity are represented. Yesterday after we parted from class, I with a couple of friends ventured off to the suggested concert at Saint Martin’s in the Field. As I entered the theatre the white ceiling made me stare in awe as I viewed the monumental structures created hundreds of years ago. As we were seated I panned the audience to see the types of people gathered to listen as a musical masterpiece would be played for our entertainment. The range of people was homogenous, being predominately white. I found myself being more reserved than I was comfortable with, but for the setting of the event it was necessary. As the music filled Saint Martin’s Cathedral the expressions on the faces of people varied in pleasure, awe, and appreciation for a work that was well deserved. The artist was successful in instilling an emotion in his audience, which I could not help but appreciate. As he played numerous pieces from Phantom of the opera I sat in my chair trying to contain my restlessness. Although the piece of music was beautifully structured in its entirety, it was a bit long for my liking, but nonetheless appreciated. After the first piece of music was preformed various areas of the Cathedral began to empty out as people headed to prior engagements, however, I stayed for the performances entirety. Once the concert had finished a group of use headed to the National Art Gallery located literally across the street. Myself along with the rest of the group grew anxious as we realized what we were about to see. As we climbed the steps of the museum our minds raced with the artist and the pieces of work that lye just beyond the doors that we were about to enter. The realization that we were privileged enough to see the art from the some of the most famous painters that had ever lived. Once inside we all parted heading to our own favorite pieces and exhibits spread across the vast gallery. I viewed countless pieces of art, created by Van Gough, Davinci, and Anthony Von Dyck. There was no doubt in my mind that these works were marvelous, and their very essence made my spirit soar. But as it all sunk in the reality of the history of these artist and their ways and own personal beliefs, suddenly made me uncomfortable. The realization, that this history was filled with racism, sexism, and countless other prejudices did not make me de-value their art, but rather gave me more of an incentive not to glorify it, as some of the other people might have. My culture and my history something that would have made me feel inspired, was not present in the entire gallery, not once, at least not in its entirety. The next day we all woke up bright an early as we headed toward the West Minster Abbey for a tour only fit for royalty, or as our tour guide put it, “a class above the riff raff.” Once we were out of the Underground, we quickened our pace to make it in time for our 9:30 tour. Once we arrived we were greeted by probably the most energetic and experienced “Blue Pin” tour guide, which only made our experience that much better. If I could try to describe the beauty of the architecture that stood before me, I would not be able to find a word befitting enough. It was remarkable beyond words. Once inside the sound of the busy city, was quickly silenced as if we were subconsciously remembering the people of the past who were buried this massive Abbey. Inside West Minster Abbey lye the tombs of 3000, kings, queens, writers, and various other of what I assumed wealthy people. Each one was given an astoundingly large monument of their own in their memory. As we past it seemed as if they were competing from beyond the dead at whose was the biggest and the best as they displayed their wealth from beyond the grave. Although its beauty could not be denied I once again felt a sense from my lack of comfort. In my eyes these were just people who were glorified based upon their wealth and status in their country. I could have thought of countless other areas in the world in which this same amount of money that was put into these monuments and tombs could be used to aid starving children and homeless people around the globe. The American Studies scholar in me could help but question the dominant hegemonic apparatuses that were in power, and how much emphasis they put on class, money, race, and power, made my skin crawl with discomfort. I could not help but realize that I along with two other classmates was the only people of color on the entire tour, during the time we spent inside. I was so used to having the comfort of others like me around all the time, and to literally be the minority among the hundreds of people touring gave me the realization that I was not at home. Among this during the entire trip I have had to become more of a reserved in the way I express my mannerisms. Being an American and from the area I come from I am used to being free to express myself in whatever way I see fit. But I am constantly being reminded that I must assimilate to a culture in order to not become an object of judgment in any given area. This among very few other things had made my time at London unexpected. However, after thinking about my roots and my ancestry I realized that I am not just black. My grandmother is from whales, and has red hair and white skin lighter than some of the people on this trip. I am not simply a black man alone in London. But because of my skin color and how I have been taught to identify I sometimes forget my entire heritage. I learned today, that I can no longer view London through the eyes of a single raced person, because that is not who I am. I am a culmination of a mixture of races whose heritage I am starting to learn. My only wish is that I could go to a place where the heritage of my complete bloodline was present. In London I have had the privilege to learn about my European ancestor’s but I am not blind to the fact that my African ancestors were also brought here. I am trying to be patient, and delve myself into the history where both parts if me can exist. I just wish I could visually see a place where this dream was a reality. My previous post on Westminster focused on the modern martyrs represented by statue on the church’s exterior as well as the riveting tomb of the Unknown Warrior. Something else has been reverberating in my head since I’ve left – humanism in the church. Humanism is a philosophy based upon the inherent human ability to reason and lead autonomous, dignified lives. Throughout history, The Church has prolifically opposed humanism. Faith, the most important and base-level aspect of Christianity, is inherently unreasonable. A basic precept of humanism is that all humans have dignity, the capability to accomplish anything they choose to set their minds to do, only limited by their own intelligence, ability, and motivation. Complete devotion and humility to God by means of faith limits dignity. Here comes the ironic part. Juxtaposing the religious symbols and artifacts displayed in ubiquity was a whole slew of scientists, mathematicians, musicians, poets, writers, and a slew of other men and women of notability. The funny part was, none of them were known for their religious achievements. In fact, Charles Darwin himself, the guy whose teachings the Christian Right battles every day, is buried in the church. Right next to an altar where services are held. I don’t know if ironic is the right word, actually. Sir Isaac Newton, the father of modern physics who happens to be enshrined on the altar exactly where a crucifix would be in any other church, was a deeply religious man. After publishing his works on gravity, he was asked how he could concurrently believe in gravity and in God. He told the inquirer that there is no doubt in his mind that the world is governed by gravity and his other findings. God simply set it all in motion. Legend has it that Darwin personally rescinded all of his discoveries with the hopes that he would end up in heaven. Darwin, Newton, et. al. are champions of humanism. They accomplished everything by their own means. Despite their religious views, it was their dignity and appreciation of reason that allowed them to dramatically change the world in ways previously unseen. The decision to so proudly display such heroes of science and humanity gives me hope for the future of Christianity. There are no stains at the National Gallery, no ashes left at St. Martins-in-the-Fields church, no mud at Westminster Abbey. The marvelous rooms at the Gallery were spotless, eye-catching, almost enormous in their own way. The paintings were the definition of time’s constant, pitiless motion. Ageless. St. Martin’s church was divine, the concert we were there to see provided me with a sense of tranquility. 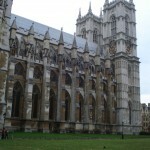 The 3000 graves of the Kings and Queens at the Westminster Abbey were serene, spotless and preserved. Protected, like a caring mother protects a child during the most crucial years of his or her life. I have always been a lover of the arts, a person who admires the individual talent of those who seek self expression, yet the stains that I saw at the places above represented a personal frustration with the lack of representation of the, what some may call, “dark history,” I am thirsty for a history I have yet to explore. As I walked the art-filled rooms of the National Gallery my soul wondered with joy, I was amazed at the pieces of art that stood in front of me: Van Gogh, Da Vinci, Michelangelo!!! I had seen these popular paintings on TV and magazines but I never thought I would the opportunity to SEE them, I was in disbelieve! yet the little girl in me who struggles to promote diversity at a predominantly white institution of higher education couldn’t help but to wonder: “Are there any non-white pictures in this entire gallery? !” I guess this is part of the challenge. When I applied to the program I expected to encounter a culture not so different from my own, but these differences appear to be overpowering the few commonalities I can find and in this way I am challenged. Some who read this blog post may think, what is she talking about? or she is clearly exaggerating, but I come from a place of predominantly diverse communities, a place where our family members, teachers and friends are the Kings and Queens of of our history and they don’t need a $2 million shrine to prove it. I am challenged by the historical representations of the paintings and yet I am intrigued by the walls of the graffiti-filled skate park walls. I question myself for being unable to feel the same type of joy for both, for choosing the walls of the skate park (under the Royal Festival Hall) over the majestic walls of the National Gallery. I continue to move forward, hungry to explore the unrepresented history. Desiring to spend more time speaking to a protester outside of the National Gallery, an activist, fighting for what he believed to be remnants of “institutionalized racism.” In him I find some comfort. Standing with him I felt inspired again. I was reminded that history, like art, evolves and is dependent on the author’s perspective. I must continue to appreciate what is in front of me, meanwhile assisting myself in the development of my own interpretations. I must not choose between graffiti and the precious work of Van Gogh but rather entertain my soul with both. I was lucky enough today to witness both sides to the Westminster Abbey. This afternoon, I went on the guided tour with my classmates and was shown the innumerable amounts of graves and memorials to some of the most important figures in British history. To say that nearly every aspect of the abbey is extravagant would be a severe understatement. There is gold everywhere and every tomb of the royal family is detailed downto the square inch. If I learned anything on the tour, it was that the royalty spared no expense when it came to one of their own (Henry VIII apparently had over 55 estates throughout England). I can only imagine how many roads went unpaved and schools unbuilt in order to fund such opulent funerals. Perhaps it was just reluctance to rebel or just pure loyalty to the crown but it is astounding what the public has let royalty of not only England but of Europe, do over history. However, I do understand that the abbey is not only a testament to royalty, but to all the great British citizens. I was especially touched by the Grave of the Unknown Warrior and the near-royal treatment it received being buried in Westminster Abby. There is certainly more than enough to be proud of in the chapels of Westminster Abby. Only a few hours later, I attended Evening Prayer at the chapel. One would think that one of the greatest churches in London would perhaps hold more appeal, but as it turned 5 o’clock, there were seats to spare in the back. In its progression to a more secular society, the British have transformed these incredible churches into mere spectacles. My guess is that St. Paul’s Cathedral, the other famous church in London, like Westminster receives most of its participants in prayer from tourists. Although there is nothing particularly wrong with it, it’s still amusing to see what these grand testaments to God have turned into: yet another photo opportunity. After a pub lunch at the Red Lion, located just a few minutes from the Abbey, Alli, Becca, Chelsea, Kim, Mara, Sarah and I headed to the Tower of London. Heading in with “great expectations” I have to say I was a bit disappointed overall. It was interesting to walk through the ancient monument but I had no idea it would draw the massive number of tourists it did. All ages were represented but I was very surprised to see a large amount of young children walking through the tower, a number of them unaccompanied by adults. The highlight of the Tower of London experience was the Crown Jewel exhibit. After being instructed to put our cameras away we were taken into a room with pressurized doors where we examined crowns that monarchs wore. In addition to the crowns we saw diamond laden rings, sceptors and golden cutlery that made our jaws drop. The most amazing object I observed was a giant punch bowl made entirely out of gold and must have weighed over 18 kilograms. Completely and utterly unbelievable! After the Crown Jewels exhibit my time at the tower went South. Due to the amount of loud, rambunctious children present and a subpar exhibit on torture in the Tower we walked through I was ready to leave after about two hours. Overall my experience was not a completely negative one. Being inside the grounds was breathtaking and the architecture amazed me. However I do not see myself returning here during the rest of my time in London. After our time in the Tower Alli, Kim, Mara, Sarah and I decided to get an early start on our walking tour project. Since our general theme is parks in London we decided it would be a good idea to visit a couple of the major green spaces in the area. We hopped on the tube and took the central line to St. James Park station. Upon arrival we spent some time moseying around Buckingham Palace and Victoria’s Memorial before getting down to business and taking a stroll through Green and St. James Park. Nothing too exciting was going on at Green Park. At one point we sat down in light green lawn chairs only to be told that we had to pay a fee in order to sit. We quickly dismissed Green Park as a space that we would focus our project on. St. James however was a different story. We immediately spotted water and wandered over where we discovered a multitude of birds including ducks, geese and pigeons. These birds were not afraid to come close to humans at all and we saw many eating out of the hands of children who were offering them bread despite the numerous signs that clearly read “don’t feed the birds”. 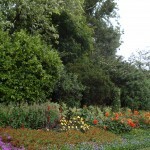 We wandered through most of the park, passing beautiful lush flower gardens along the way. Overall St. James seemed more alive then Green Park and we definitely plan on heading back to take another look when the Park Office is open and we can receive more information about it’s history. Today was a very rewarding day overall. I am happy to say that I was able to visit some of the most historic places in the country in one day and ecstatic that my experience at Westminster Abbey went so positively. I’m amazed at just how much I have been able to see in one week here and I know that I continue to see more and more incredible places during my time here in London. Next up: Stonehenge! Today was an interesting contrast in English History, with one site having become completely commercialized and the other having remained protected. We began the day in Westminster. 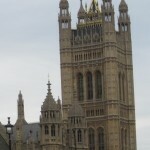 Even though it is one of the sites in London that is synonymous with the city it does not suffer from commercialization or due to the number of tourists. Yes, there were numerous individuals wandering through with the audio tours and other tour groups besides our own, but they did not hinder our experience in the abbey. Beyond that, every hour on the hour we were asked to observe a moment of silence for either prayer or contemplation. It was a simple and effective way to remind everyone within the abbey that they were in a sacred place. We could appreciate the tourist attraction of Westminster, while still noting that it was a church with more meaning than just beautiful architecture and memorials. 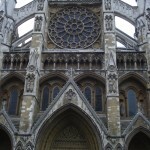 Westminster Abbey is an essential part of what London has become today. They have managed to share a beautiful piece of history while maintaining its integrity and historical accuracy. 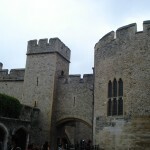 The Tower of London in comparison has become a commercialized tourist attraction. It was similar to taking a history-lite course. The entire site had been turned into recreations and tourist traps. There were multiple gift shops, hawking imitation, jewelry and mock swords. It seemed that most people wanted to see either the Crown Jewels or the Bloody Tower, by far two of the most famous attractions within the Tower of London. The most informative part of the Tower were the sporadic movies shown throughout the various towers and exhibitions, however they were made difficult to view due to their placement in crowded rooms with a heavy traffic flow. 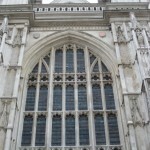 It seems to be a shame that not all the historical sites of London can be as protected as Westminster Abbey. We found the Tower of London to be somewhat of a disappointment and that we spent more time waiting to view small exhibits (the Bloody Tower) than we did actually learning from the site. We were most interested in the Bloody Tower and Crown Jewel collection which turned out to be two of the smallest exhibits in the entire castle while having the longest lines. Honestly, it seemed that we gained more from wandering along the walls and through the grounds of the Tower instead of the actual exhibits. "It costs 1.50 to sit in these chairs"
Despite the rain today, I was pretty pumped about going to Westminster Abbey. But now as I reflect this evening, I am really disappointed. The experience reminded me of visiting St. Peter’s Basilica when I was a sophomore in college; gaudy and excessive. I’m not really sure what I was expecting, maybe something more to do with religion than money. But I am quickly learning that the hokey pokey isn’t what its all about anymore. It’s about money. Audrey and I talked a lot about this and we are of similar thinking. When did this sacred place where monks once walked the halls in silent prayer and devotion to God become an elaborate tourist attraction? Don’t get me wrong though. I really loved learning about the history and the importance of the Abbey as a historical site. But that’s just it: it reminded me of a beautiful museum rather than a house of worship. Ultimately, I left today with a sense mostly of frustration. After the tour of Westminster Abbey, a bunch of us headed to grab some lunch before heading over to St. Jame’s park. We walked into a tiny sandwich shop that offered us the option to eat in or take it. In the States, mostly we would eat in and not expect to be charged more for seating; just the food and the tip. We learned though, that if you eat in you are charged almost 3 pounds extra. Again, I wonder if we are all just charging extra just because we can, or not. Though this seems insignificant, I think my point ties in to the overarching theme that money has the power to dictate an experience, to change it for better or for worse. Again, though I know others have blogged about this story, this same group I was with headed to St. James’ park to relax and enjoy the sweet outdoors whilst munching on our delicious sandwiches. We plopped ourselves down into some vacant seats and happily discussed the morning at the Abbey. Then a man walks over and tells us that we need to pay in these seats. Now really? I am still indignant to this very moment as you can tell. We are sitting outside, enjoying a brief moment of sunshine, and we have to pay? Instead of leaving, most of us hastened to sit on the grass and abandon our chairs. I don’t understand how a public park would charge you to sit. That’s like charging someone to walk on the street or, dare i say it, sit inside a restaurant and eat. Apparently money can’t by happiness, but it can buy you comfortable seats in park, in a restaurant, and an entry into an Abbey. As I’ve said to some of you in conversation, I don’t consider myself to be a very religious person but I am rather spiritual. Visiting Westminster Abbey today was INCREDIBLE, and so I really wanted to attend Evensong since I’ve never experienced an entire mass in song. Unfortunately, the choir was not available this evening but we stayed for Evening Prayer instead. The whole church “process” felt familiar to me, and was thus comforting. Much of the ritual and most of the prayers were exactly the same, and so I enjoyed having a small taste of home. I think that religion can either be one of the most unifying or one of the most dividing factors between cultures, depending on how you look at it. For cultures that subscribe to entirely different religions, I’m sure it’s a difficult obstacle to overcome and that agreement or even healthy debate is nearly impossible because it’s such an emotionally and personally charged subject. However, I come from a varied background (I grew up in a Reformed Church, then a Nondenominational Church, went to a Catholic youth group, work at a Protestant summer camp, and agree with many ideas from other religions such as Buddhism). Therefore, I find it easy to notice details or concepts within almost any religion that I can identify with. Westminster Abbey’s service was so similar to Catholic services I’ve attended, and I remembered a homily from the United States in which the priest said that “everybody meets in the Eucharist.” Even though the people I sat with during the service in London were strangers, from assumedly varied backgrounds, we experienced the same ceremony together. I found it to be a bonding experience, because even if we didn’t all necessary believe the same things or wholeheartedly agree on all the things stated, we all attended and stayed for the entire service collectively. Maybe I’m alone here, but I found that somewhat comforting. I understand that religion can be a touchy subject, but it is important to me and I enjoy knowing that it can (and did) carry over between my home in America and my new experience in London. Light – unnatural light from the hulking, undoubtedly gilt chandeliers and natural light which poured in through massive, paned windows – set a noonday glow upon the carved stone walls of Saint Martin in the Fields yesterday. The same light spilled onto the crowd that had gathered to watch the performance. For a donation of a few pounds – or nothing, if one desired – appreciators of music of all ages had the opportunity to attend a performance by E.L.F., a trio comprised of a pianist, flautist, and horn player. The three are known for their versatility, playing anything and everything from classical and pop music to arrangements from soundtracks and musical scores. At St. Martin in the Fields yesterday, E.L.F. stayed true to their reputation, playing a variety of pieces, but none nearly as powerful and interesting as Phantasia, based on Andrew Lloyd Weber’s famous The Phantom of the Opera. E.L.F.’s interpretations of hit songs such as “Music of the Night,” “Past the Point of No Return,” “Masquerade,” “All I Ask of You” and, of course, “Phantom of the Opera” were unexpected and enjoyable. Tempos were adjusted, notes and rests altered to create surprising syncopation, harmonies and jarringly dissonant chords created where none existed previously. At one point during the piece, “All I Ask of You,” a deeply emotional – and during the reprise, truly painful – love song segwayed beautifully into “Masquerade,” a joyful song with an element of whimsy. The transition was unexpected, but surprisingly appropriate and effective. What else I found to be especially inspiring was the obvious love of the art felt by the performers and the flautist in particular. Even when he was not playing, the flautist made eye contact with his fellow members, smiled, rocked and tapped and swooshed to be beat – or off-beat – of the music, as if all the nerves in his body were firing and playing their own fleshy instruments rather than the flute lying in anticipation at his side. The light glanced off of the musicians’ instruments as they walked off and bowed to the crowd. The light burned my eyes as I left bliss inside St. Martin in the Fields and walked out into the crush of humanity that is Trafalgar Square. The light left shadows under my feet. After spending all morning viewing the beautiful architecture of The Collegiate Church of St Peter at Westminster (or Westminster Abbey) I decided to take advantage of two hot spots close to the hotel; the British Museum and Oasis Health Club. Unfortunately the latter was closed to the general public, but I was still lucky enough to journey over to the British Museum. Upon walking into the museum I was immediately taken aback by the vast size of the lobby. I couldn’t possibly imagine what was beyond the walls of the entrance, but we grabbed a map and decided to plot out our route. After simply staring at the map for a few minutes Patsy and I noticed a section at the bottom that said, “Make the most of your visit” followed by a series of objects spread out throughout the museum. We decided that this would probably be our best bet and we were off. Because of the vast size of the museum, and the number of objects on the, “Make the most of your visit” list we were only able to get through about half of the objects. But I am excited to return to the museum and to finish moving through the rest of the museum.